Marble’s natural refinement makes it difficult to tip the scales into “overly” trendy. Stone designs always come out looking timeless. But even timeless marble has its own set of trends. One of our favorites at Kreoo is pairing marble with different metals. Metals are a gorgeous contrast against the cool sheen of natural marble. Over the years preferences have shifted from brass, to brushed nickel, to copper and back again. 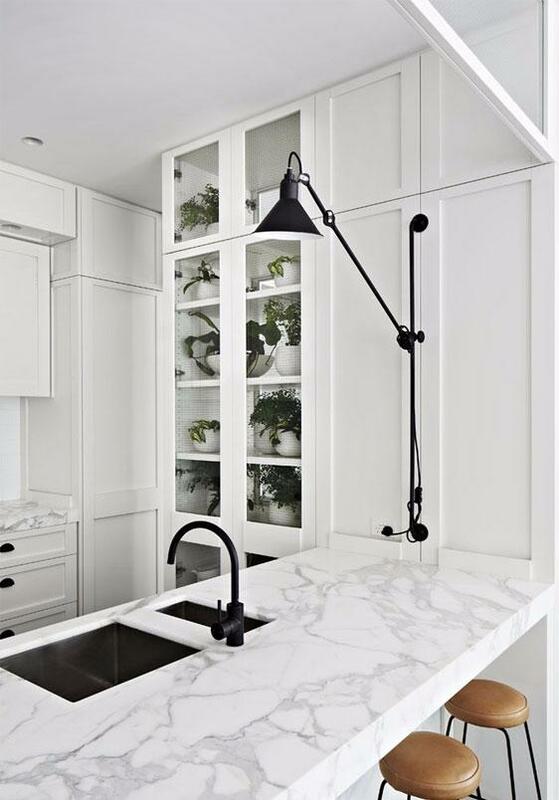 Today we’re highlighting a combination a stunning combination that’s gaining popularity: Matte black fixtures on white marble. This stunning bathroom is the first shot that hooked us onto this trend. It’s a work of art, beautifully done. A combination that sets off every element to advantage. 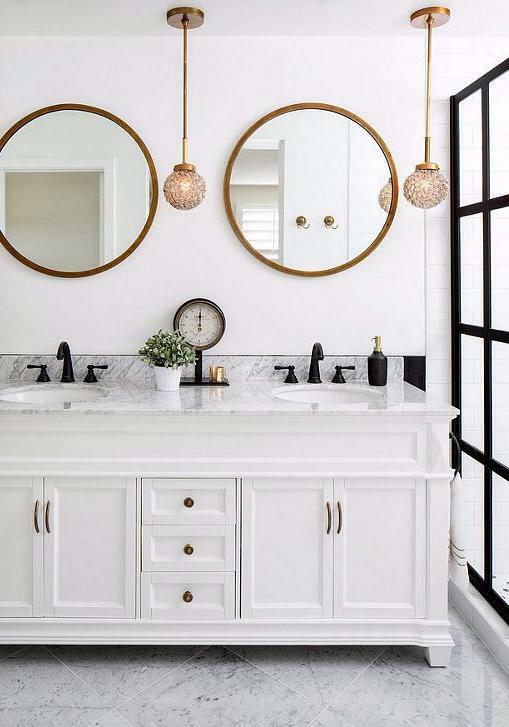 We could just stare at this bathroom forever. The movement of the grey veining in this marble-slab backsplash contrasts beautifully against the clean lines of the black accents. The matte finish adds a softness that pairs with the subtle gray scale and keeps this room from looking too sharp. Bathrooms aren’t just about shower walls though! A sleek, freestanding marble tub like Kora, with its matte black supports, is the perfect artistic centerpiece for a modern bath remodel. Matte black fixtures are just as chic in the kitchen! 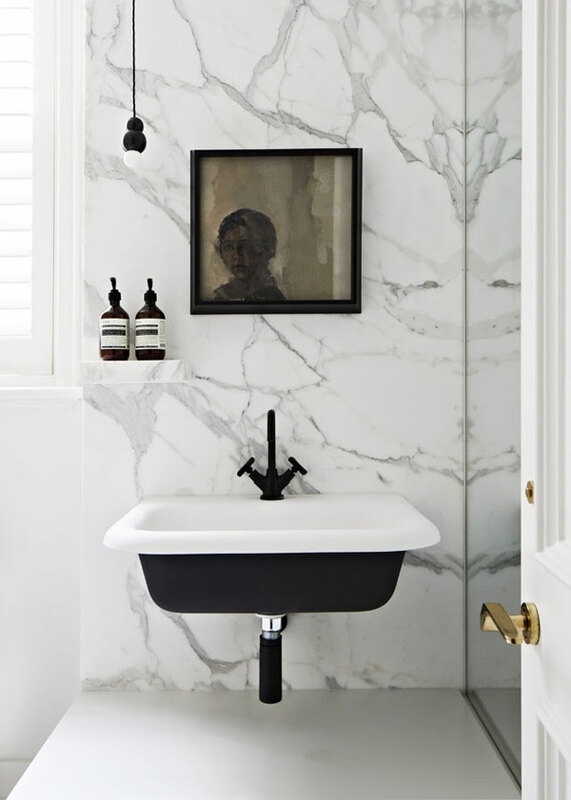 We love the black wash basins and the quirky adjustable light in this modern marble kitchen. Green plants and tan stools add some warmth and liveliness to the cool tones and clean lines. This matte black trend isn’t always starkly modern – this sweet, updated traditional bath combines matte black fixtures with copper hardware and mirrors to brighten up this cheery space. If you want to hop on the black and marble bandwagon, you’re not limited to fixtures alone. 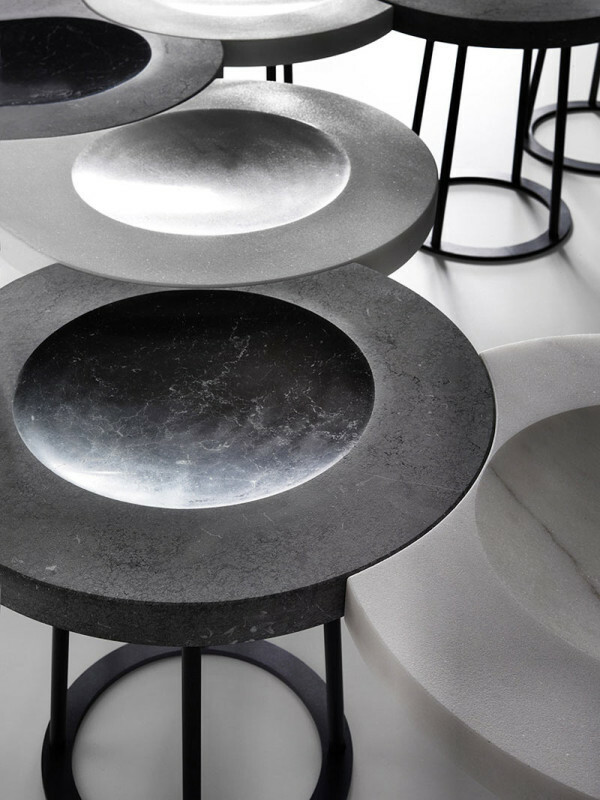 Furniture elements like Moon stools, with black steel stands and dozens of marble options, are a sleek and flexible option. Yes, we know this article is supposed to be black and white, but if that’s too monochrome for your tastes, have no fear. 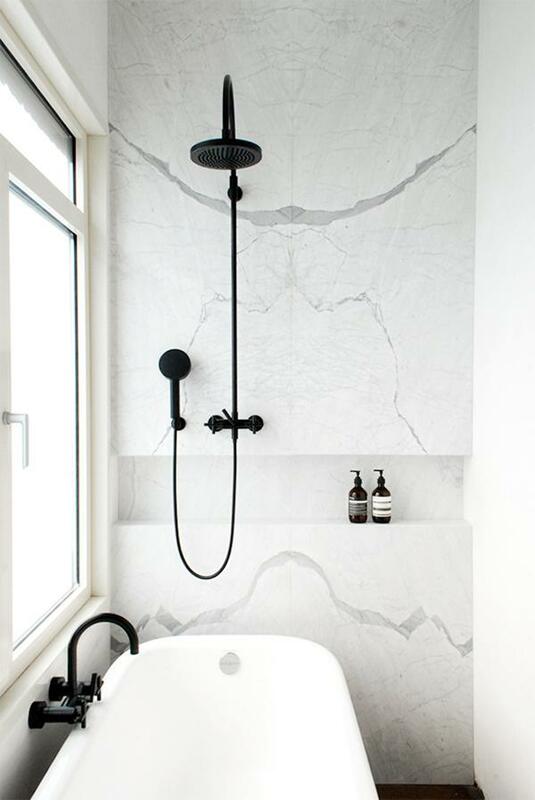 Matte black fixtures are a dream on colored marble too! Like this luscious caramel colored marble slab. Or this masculine, teal and grey spa. So what do you think of the Matte Black on Marble trend? Could you see this concept working in your home? Comment below and share your design plans. Kreoo offers marble furnishings as well as custom marble for Home, Corporate and Hospitality applications. Contact us for your next marble project!